Are you looking for a new way to trade: a highly optimised trading experience that is fair and safe? At JFD, we offer you direct, anonymous access to 1500+ instruments from 9 asset classes, including forex and precious metals, indices (cash and futures), cryptocurrencies, stocks, commodities, bonds, ETFs and ETNs - all this sourced from 20+ LPs (Tier1 Banks, Non-Bank LPs and MTFs). Test JFD’s trading conditions with a demo account or open a live trading account directly! Making sophisticated trading more easily accessible to all types of traders, as well as more effective and flexible, has always been our goal, which is why we offer award-winning trading platforms to meet your needs. With access to all markets, with the same trading conditions for all clients, JFD gives you the chance to explore your own personal trading style and make the most of your skills and knowledge. JFD's MT5+ is the definitive version of MetaTrader 5. Packed with new features and exclusive JFD Add-Ons, this platform is a must for every sophisticated trader. Our upgraded MT4+ features all you have come to like about this platform, combined with additional exclusive JFD Add-Ons to enhance your trading. Guidants, with its interactive and customisable desktops, along with our just fair and direct model, enables you to take your trading strategy to the next level. We are the only retail broker empowering all clients to trade all available markets under multiple platforms with just 1 pricing, 1 execution and 1 account type. No discrimination, no confusion! When it comes to trading, time is money. In the competitive environment of the global financial markets, it all comes down to speed and reliability. Electronic trading systems and strategies depend on the infrastructure upon which they are executed. This is why we partnered with NASDAQ listed firm Equinix, where we participate in the Equinix Financial eXchange, which is a network of execution venues, buy and sell side firms and bank trading servers that are located at Equinix's high-performance data centres. The Equinix Financial eXchange provides us with access to the widest choice of low-latency networks, and the ability to directly exchange data with strategic partners and customers in close proximity, guaranteeing the fastest possible execution (often < 0.01 seconds). 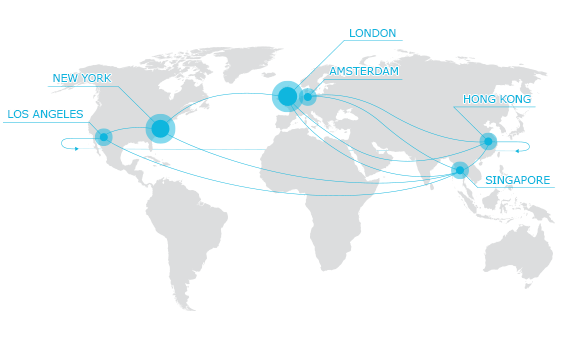 JFD’s servers are directly interlinked to multiple providers like Tier1 banks, non-bank Liquidity Providers and MTFs, cross-connected via fibre optic cables within the Equinix data centres in New York and London (NY4 and LD4). What does JFD’s execution have to offer? The broadest geographic reach, the largest choice in networks and the most efficient connectivity options. Advanced trading strategies and EAs require non-stop connection to the markets 24/7. At JFD, we are always trader-centric which is why we have carefully selected different hosting solutions suitable for different trading requirements, negotiating special conditions and discounts for you. Embrace the world of high-speed trading by connecting to JFD with our VPS providers, and enjoy ultra-low latency access to our server network, resting assured that your strategies are running continuously… so you never miss a major trade. All live clients of JFD are entitled to a 50% discount with Fozzy! Fozzy is an international web-hosting company with fast and secure web access backed up by cutting-edge technology. Fozzy's multiple windows-based VPS solutions apply a fully licensed Hyper-V virtualization architecture for system stability and flexibility in the long-run. MyTradeHost (MTH) provides fully automated and continuously monitored hosting, delivering technology solutions for reliable low latency proximity trading. MTH comes in different versions, according to your needs and preferences: Lite, Standard, Pro and Enterprise. JFD does not guarantee the accuracy or completeness of the information listed above, although it is believed to be accurate at publication date. JFD does not receive any income from referrals sent to any of the third-party companies listed above. We want our traders to be successful, which is where research comes in. Our award-winning Global Investment Research division provides institutional-grade technical and fundamental research and analysis with a particularly strong focus on currencies, precious metals, indices, commodities and stocks. Our team of experts produce numerous insightful, multilingual articles and live stream videos on a daily basis for your sole benefit. Useful for all types of traders, from intraday to long-term investors, all our research is published online and available absolutely free of charge.